Do you have a favorite meatloaf recipe? Most people do. I do not. I guess it’s because I can never leave well enough alone. I am always looking for that elusive “best” combination. This recipe comes pretty close to being in that category. It helps that it was first published in Gourmet Magazine, I have found that their recipes are almost always outstanding. Some say that for a meatloaf to be great it has to have a combination of ground beef, veal and pork. The supermarkets even sell a combination of meats for meatloaf. I have made meatloaf with all ground beef, ground turkey and with various combinations. This meatloaf adds ground pork to the ground beef mixture and it enhances the flavor. But what sets this recipe apart is the addition of dried cherries and bacon. You can use any dried fruit that you like, but I like the cherries. Three strips of raw bacon and the cherries are ground together in a food processor and added to the meat mixture. It adds a nice sweet and smoky flavor to the meatloaf. The carrots, celery and onions also contribute to the texture. Give this a try for dinner. If you have a meatloaf that you love and would like to share it, email me with the recipe. My quest is ongoing. Meanwhile, cook onion, garlic, celery, and carrot in butter in a large heavy skillet over medium heat, stirring occasionally, 5 minutes. Cover skillet and reduce heat to low, then cook until carrot is tender, about 5 minutes. Remove from the heat and stir in Worcestershire sauce, vinegar, allspice, 2 teaspoons salt, and 1 1/2 teaspoons pepper. Add to bread crumb mixture. Pack mixture together into a loaf and place in a shallow baking dish. Spread ketchup over top and bake for approximately 1 1/4 hours. That sounds really good! And your picture is fantastic Penny! My meatloaf recipe was the plain that my kids loved that I made for 40 years…have not made any in quite a while. I do not have a go-to meatloaf recipe, either. This one sounds delicious. I printed it out to try. Fantastic photo of the meatloaf Penny. It’s not always easy to make meatloaf look pretty and you’ve done it. I think I might try it with the prunes. I am on it! All week I’ve thought about meatloaf and then was halted by my lack of the “perfect” one. I know this is it and can’t wait to try it. Great post! I absolutely LOVE the idea of adding dried cherries to a meatloaf Penny. That is one gorgeous photo! I have never been able to make a meatloaf that didn’t taste like hamburger with ketchup. Hope this is the magic one. I love feed back on my recipes. Appreciate you taking the time to let me know that this is a winner. Thanks Kathy. OMG! Made this for dinner tonight & also added some green pepper, ABSOLUTELY AMAZING! Best meatloaf I have ever had! THANK YOU FOR SHARING! So glad you liked it Leslie. Thanks for letting me know. My mom has made meatloaf for years and it’s always been my favorite. When I tried to make it on my own, it wasn’t the same. I’m so glad I found this recipe because it was SO good. I don’t know which ingredients brought out so much of the flavor, but I loved it. Thank you for sharing! Thank you Emma. You made my day. Do you cook the bacon first or just leave it raw when you put in food processor with cherries? The bacon should be raw. The bacon is supposed to be raw. Yea! If the kids love it, it is a winner. Thanks for sharing. THANK YOU FOR THIS RECIPE!! I forgot to get the cherries so I made it without them and it still came out delicious!!! My goodness, our dinner guests left NOTHING! One of the guys said it was the moistest he’s had and my hubby said was the best meatloaf he’s eaten! I should be offended cause that means my past meatloaves weren’t that great right? 😛 Haahaaha! Well from now on this is the recipe I will use! Thanks again! Can’t wait to try your other recipes! I must say great recipe! It was my first time making meatloaf and it came out very moist and tasty!! Will probably leave bacon out next time but otherwise amazing!! I used cranberries since that’s what I always have my Daughter thinks there candy, I mixed siracha, pureed cranberries, and sun dried tomatoes to the ketchup and sprinkled frizzled shallots on it when done. Also if you add an extra egg and half cup of cooked rice they make an amazing meatball that way served with a bbq sauce. 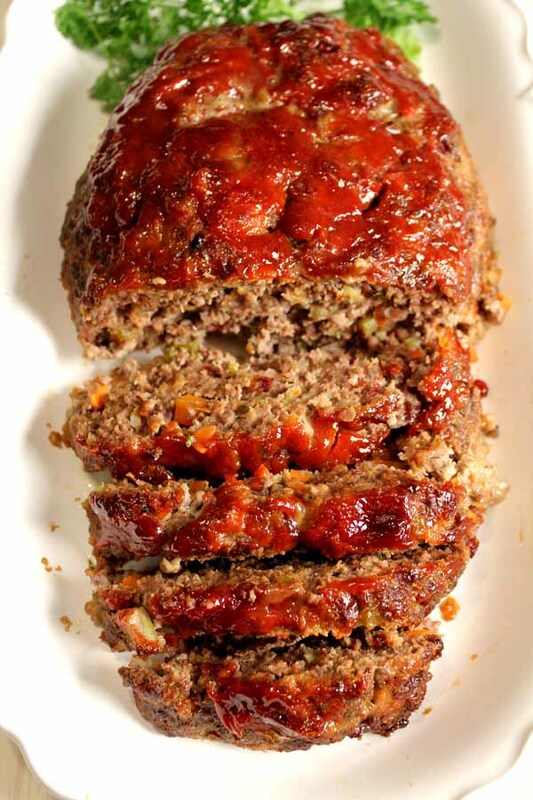 The best meatloaf ever…. I added spinach ,red Pepper and some sundried tomatoes. So glad you liked the meatloaf. I love your additions. Thanks for your comment. I have made this twice and it is PHENOMENAL….. Best meatloaf you will ever eat. A little work but it is VERY worth it. Thank you Alysia. I appreciate your feedback and glad that you loved the meatloaf. Phenomenal. Found this via pinterest and so glad I made it! 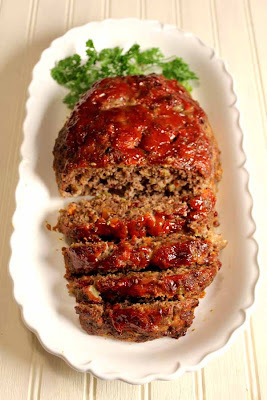 My go-to has always been epicurious.com’s “Old-Fashioned Meatloaf.” This is even better. The dried cherries and bacon are a game changer! Jenna, Thank you so much for the feedback about this meatloaf. So glad you loved it. It makes me happy to know that recipes I have posted are winners. You are the best! Best meatloaf recipe I have ever used. Made this for my hub’s birthday dinner. He said that he wanted meatloaf, but I wanted to make him something a little more “fancy.” Wowzers! The dried cherries added a hint of sweetness, but they were undetected by the hub and kids. This is the meatloaf to make for people who say they don’t like meatloaf. So glad that your hubs liked the meatloaf. I appreciate it when kind people like you give me feedback. Thank you so much Kristi! this is exactly the same as the meatloaf I always make from Epicurus. It’s the best! I always cry the bacon a bit before throwing it in but otherwise it is perfection!! I found this recipe a while ago and have made it plenty of times. I also make meatballs using this recipe. Everyone raves. The only difference is I use more Italian sausage and less beef and don’t always measure the bacon. Yum! Also, I was one of those kids that wouldn’t be allowed to leave the dinner table because I didn’t finish. I hate meatloaf. I love it now. Becky, You have made my day. Thank you! So glad you like this recipe so much. I would say 4 to 6 depending on what kind of eaters they are. 2 lbs. of meat yields 6-1/3 lb. servings. I found this recipe on Pinterest….I didn’t had the dried cherries so I substituted with dried cranberrys…..is the best ever!!!! Thanks for sharing this recipe. thanks for the recipe. Definitely going to make this. In my quest for the perfect meatloaf, Bobby Flay uses his dad’s recipe. I’ve made it for my family several times and it’s our favorite so far! You might be ready for a Bobby Flay throw down! Bring it on Maureen. Let me know the results. Thanks. This was incredible! My husband said there was no need to try any other meatloaf recipes…and I agree! Thank you for sharing this! I love this recipe and plan on making it tomorrow. I’ve always had a problem with meat loafs in the past, with do you bake it covered or uncovered all the way through the entire cooking process? Please advise. Its cooking now, will comment again. I hope it works for you Gary. This is the best meatloaf I have ever eaten. I have shared it with so many friends. Thank you! I missed adding the salt and pepper. Didn’t see it on the ingredients list. This meatloaf was Outstanding! Made this tonight and my husband loved it also! He said it was the first time he didn’t have to add ketchup to it, it was so moist! The only add’l item I added was a diced up bell pepper.This will become my go to recipe. I doubled the recipe and made 4 add’l smaller loaves to take to my grown children’s homes so they can try it (along with the recipe)! Thank You! Hi PENNY! I’m going to try your recipe today. Please tell me if the meatloaf is supposed to be covered, or uncovered (w/ foil, e.g.) during the cooking process?? Thank you so much! how many servings does this make? I am planning on making it on Thanksgiving in lieu of a turkey. We will be 7 adults and 3 kids. I was thinking of 1.5X or 2X? What do you think? To be on the safe side, I would make 2 meat loaves. If you have leftovers it makes great sandwiches. Happy Thanksgiving Matt. I’m definitely going to try your recipe as I have never been able to make an outstanding meatloaf and I am a fan of meatloaf. I have been making this meatloaf for several years after I first saw it in a magazine. It is the best meatloaf I have ever tasted. Fantastic! Any suggestions for substitutions for the bread? I’m limiting carbs so bread and crackers are not something I can eat right now but the recipe sounds amazing!! This post was published by Penny on March 14, 2012.